・NEW surgical procedures are included for each species - many with illustrated, step-by-step instructions. ・NEW coverage of the physical examination includes cow, swine, goats, and sheep, to facilitate more accurate diagnoses of medical or surgical conditions. ・Consistent, logical organization makes it easy to find important information, with each section devoted to a single animal and chapters organized by body system. 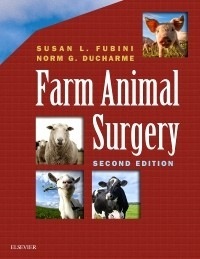 ・Step-by-step guidelines cover bovine, sheep and goat, and swine surgeries by body system. ・775 full-color photographs and anatomic drawings illustrate common disorders, techniques, and equipment for large animal surgery. ・Up-to-date information on key surgical techniques keeps you aware of advances in the field and practical knowledge of animal care. ・35 expert contributors provide a diverse, authoritative perspective on the many aspects of large animal surgery. ・References are provided for very specialized procedures.